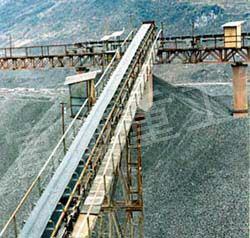 This product can be used in continuous transportation in mining and cement industries. the generality is good, exchange ability is good and create simple, easy maintenance, can save a lot of investment in infrastructure, meanwhile can speed up the progress of the project. When used on the ground, it can reduce area and investment cost. Technical Characteristics：The product uses the ordinary smooth or deep type conveyor roller device, and this is the main technical to deal with large angle of transportation. Maximum conveying Angle on delivery can reach 28° transported under 25°, coal up to 20% moisture content, reached the international advanced level. 1、The starting device adopts viscous liquid starter soft starter system, which has an excellent soft-start performance, can achieve the no-load motor start-up, normal operation of the multi-motor balance and stopping power in the process of soft-stop, and its integrated high-performance, compact structure, reactive low power consumption, performance and speed. 3、Control system uses a belt conveyor BSY-5/127 Explosion-proof electric control devices or KZW1-660 (X) Explosion-proof conveyor electric control device. Control box to control the use of PLC as the core of a variety of special protection and conventional complete protection. Matching the console for use in drivers, and work to improve the equipment, fault type, conveyor speed and the main electric current display. DT Ⅱ type universal fixed belt conveyor. DT Ⅱ type universal fixed belt conveyor is a widely used transportation device in departments such as chemical, coal, metallurgy, building materials, electricity, light industry, food and transportation.. Applicable to transmission capacity of 0.5-2.5 tons / m 3 of bulk, powder loading, such as bulk materials, can also transport items.